WASHINGTON – Members of the nation's largest Latino civil rights organization demanded the resignation of the group's president and its board and CEO repudiated his statements endorsing President Donald Trump's demands for a border wall, visa restrictions and other immigration measures. 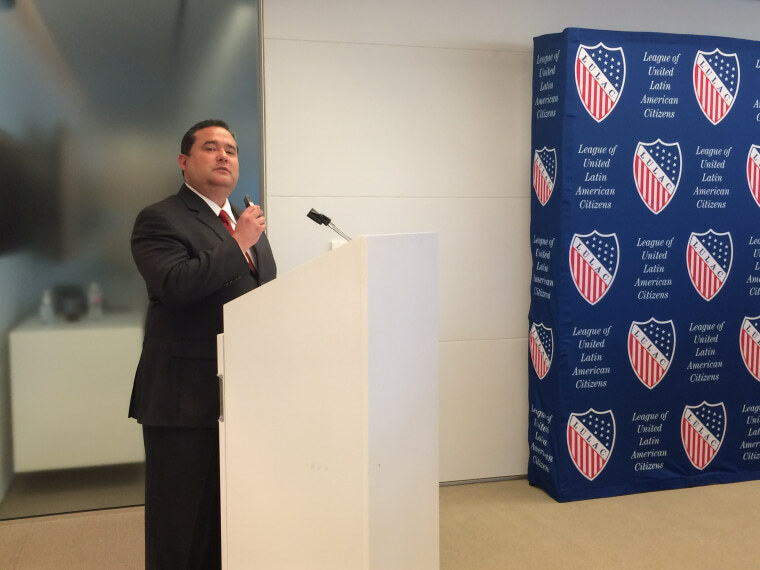 The League of United Latin American Citizens' six Midwest state directors demanded the immediate resignation of LULAC national President Roger Rocha Jr. for telling Trump in an official letter that LULAC supports his immigration plan. The LULAC Young Adults and Collegiate LULAC and LULAC California District 17 council also demanded his resignation. Rocha's support for Trump's immigration plan drew immediate backlash from volunteer members of LULAC councils around the country, according to a statement provided to NBC News by Midwest Region officers. "A motion was made and passed by the six LULAC Midwest State Directors, National Vice President for Elderly and National Midwest Vice President to demand that LULAC National President Roger Rocha Jr. do the following: 1. Retract the letter sent to U.S. President Trump; 2. Formally apologize to the national board for his action and 3. Resign immediately," the Midwest group said in a statement. The young adults and collegiate LULAC members reminded Rocha many LULAC members would be direct beneficiaries of a DREAM Act. In a letter to him and shared with NBC News, they said they felt he had betrayed them and their work organizing communities. "Your resignation will ensure that our credibility as advocates will not suffer further damage as consequence of your recent or future actions," the LULAC Young Adult delegation said in its letter. The board met Thursday to discuss Rocha's action and future. No decision was made but the board meets again later this month. Rocha told NBC News on Wednesday that he would be retracting the letter. Should Rocha refuse to resign, the LULAC Constitution stipulates a process for removing him by suspension, impeachment or removal of national officers. Some leaders said their members want to see the board move forward with that process in the event Rocha refuses to resign.The LULAC constitution requires that the complaints be made and then brought to a hearing. "The thing I’m hearing form my community now is that they want LULAC, what they feel is it is a democratic organization where no bully can get away with abuse," said Joe Enriquez Henry, National Vice President, Midwest Region. "What they see in Roger is what they have seen before in the work environment and elsewhere ... They seem him as a bully. They see him as Trumpster and they want us to take care of it right away. The community does not want another Trump." In a Jan. 28 letter written on LULAC letterhead, Rocha backed Trump’s calls for more border security, including a border wall, drastically fewer visas for legal immigration and the elimination of the visa lottery. In a statement, the LULAC board made clear those were not the official positions of the group. "The League of United Latin American Citizens has long supported the passage of a clean DREAM Act that would provide a pathway to citizenship for 1.8 million immigrants who were brought to this country as children by their parents and have graduated from high school," the LULAC board said in its statement. LULAC said its position has been clear, that the DREAM Act should not be coupled with border enforcement measures or elimination of family-based visas, which help citizens and legal residents sponsor family members to migrate to the U.S. The board stated that its National Assembly also has adopted resolutions opposing "Trump's offensive border wall along the US/Mexico border," "efforts to force state and local governments to enforce federal immigration laws," and "opposing the increased detention of undocumented immigrants." The letter was cited by Senate Majority Leader Mitch McConnell, R-Ky., of an example of Latino community support for Trump’s proposals. There is strong support in the Latino community for providing a path to citizenship for people without legal permission to be in the U.S. and strident opposition to a border wall, as well as to heightened use of local law enforcement for immigration arrests because of concerns about racial profiling. LULAC's toughest words came from Brent Wilkes, who has served for three decades as LULAC’s executive director and CEO, but is due to leave the organization this summer. In what he described as his personal statement, Wilkes said he is “saddened and shocked” by Rocha’s letter. “My name is the second name that appears on that letterhead, underneath that of Mr. Rocha’s," he stated. "For that reason, I want to state unequivocally that I reject Mr. Rocha’s endorsement of the president’s stance on immigration and can state with authority that his letter does not represent my personal views, nor those of many of the dozens of people with whom I have spoken." Wilkes said Rocha used his name and those of other LULAC board and staff without their consent. Wilkes rejected Rocha’s statement that LULAC would do its part to make the president’s vision a reality. “I want to be very clear: the “we” that Mr. Rocha referred to does not include me personally, nor in my role as CEO of LULAC," he stated.